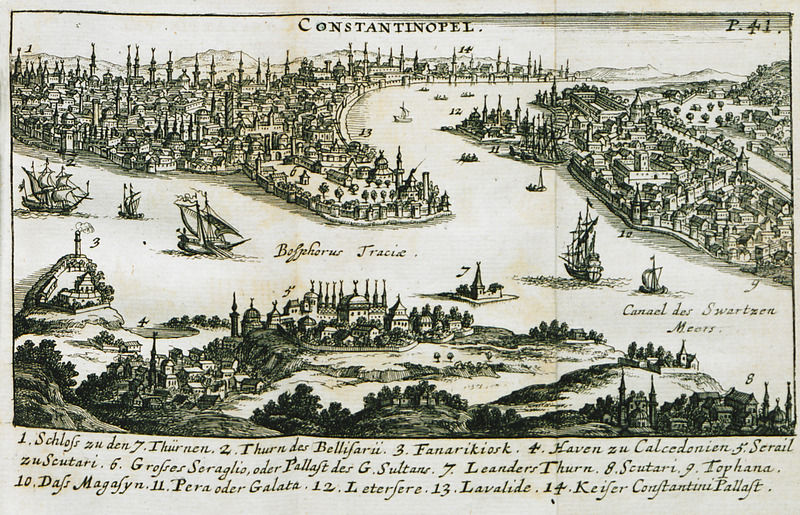 View of Istanbul. 1. Heptapyrgion or Yedikule castle 3. Fenerbahçe quarter. 4. Port of Kadiköy. 5-6. Scutari palace. 7. Tower of Leander. 8. Port of Scutari. 9.10 Tophane quarter and street market. 11. Galata and Pera district. 12. Shipyards of Kasımpaşa. 13. New Mosque (Mosque of Valide Sultan) 14. Palace of Porphyrogenitus.